Dramas on the High Seas! Okay, okay, Moreton Bay may not exactly be classed as the High Seas, but there were plenty of dramas today and since I’m a writer I’m expected to embroider the facts, right? So it started off well with Zeus the Old Salty Sea Dog going for a ride in the rubber ducky. Anchoring was uneventful – tick that one off this list as well. Next we tried out the oars. They worked, as did GW’s muscles, right up until the housing on the oar-lock broke… Lucky we both used to paddle canadian canoes in a former life! Roo Bin Esque bobbed serenely, oblivious to the dramas. Back on board it was time to hoist the sails fully for the first time. Yay! 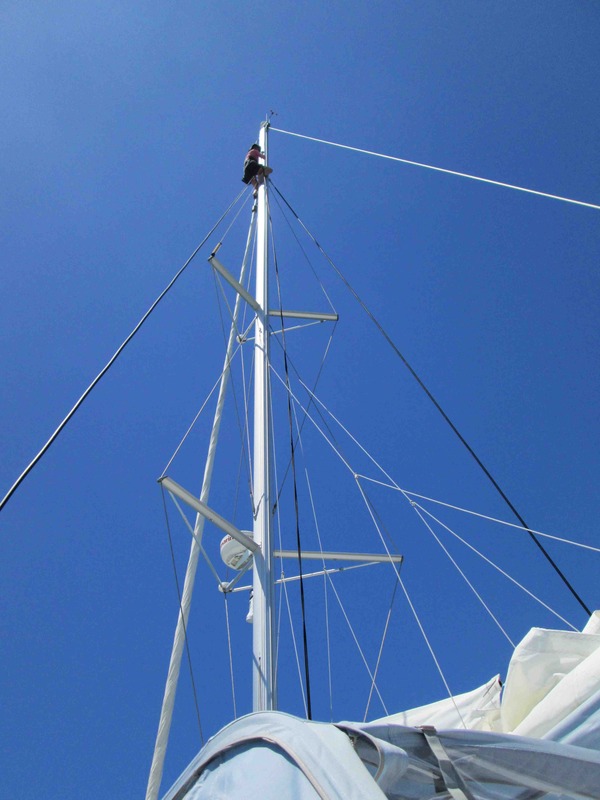 With a modest amount of messing about (read that as a truckload…) we finally had the mainsail to the top of the mast. 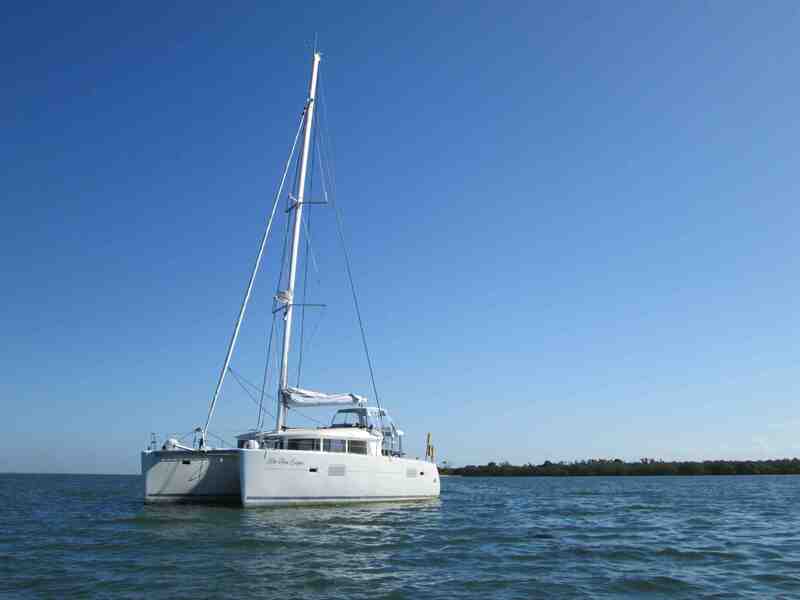 It was a perfect day on Moreton Bay and we smugly sailed along. Hubris is a dangerous thing… The time came to take the sails down. Everything was ready to go, ropes were released and ? Nothing… We tried turning her out of the wind then into the wind. We tried pulling it higher and letting it drop again. I tried feeding the rope up the mast, but the sail remained in blissful ignorance stuck at the top of the mast. There was only one thing for it. I had to go aloft. The view from 20 odd metres up a mast is magnificent, exhilarating and scary. I now have a whole new range of physiological reactions to fear to use for future characters in jeopardy. (There’s always an upside!) I also have a whole new range of bruises, but that’s another story… With a lot of brute force and persuasion we finally got the sail to drop and headed back into the marina. With a chubby boat like ours the wind plays havoc when you’re driving into a mooring pen. It takes patience, skill (and we’re still learning) and you need space. The gods hadn’t finished with us yet. This was the scene as we came through the leads and into the marina. The dinghy racing fleet was heading out. In the process of trying to do a 360 and clear the area a familiar voice hailed us from one of the dinghys. Ralph Stutchbury it was lovely to see you, but next time I hope it’s less eventful. We’re moored up now waiting for our first real guests to arrive. The evening is golden and soft. Nothing like a drama or three to make you appreciate life! Blog Australian Romantic Suspense, Burning Lies, Half Moon Bay, Helene Young, Lagoon 400, Penguin Australia, Roo-Bin-Esque. permalink. The bay spoiled us rotten, Sandy 🙂 I felt a little silly getting on the deck and croaking ‘water, I can’t swallow’ but it was the truth and the whole way back down to the deck I’d been thinking about where I could use all this emotion! Love McCoy’s quote and now Rooby has been showered in champagne and Neptune, Huey and Aphrodite have also been given offerings we hope for a long and happy relationship together! LOL. I do that too when I’m experiencing a horrible emotion. I analyze every reaction of my body and make a list. I can see a new book out of this!!! Jess, thankfully the winch did all the work hauling me to the top but I was hanging on pretty tightly as well!! 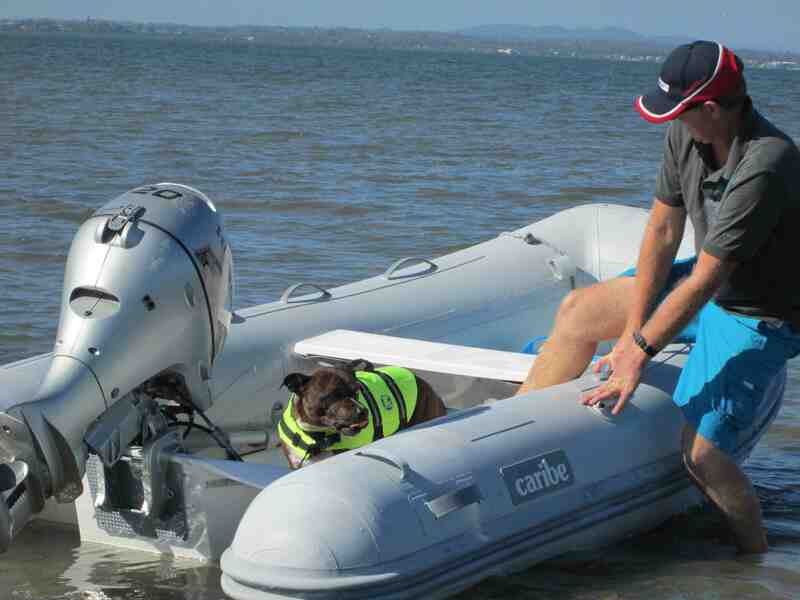 I know exactly what you mean about mooring in the Whitsundays! We’ve done bare boat charters there a couple of times and there were always good tidal flows and wind to wreak havoc with us there too. I suspect I will always be a little nervous coming into dock – so many things can go wrong! Oh Wow, you sure did have one hell of a day! I commend you for getting to the top of the mast to fix the sail. I know you needed to do it, but I still don’t think I could have; knowing my luck I would have got stuck up the top ad someone would have to come save me. Naww Zeus looks like he’s having fun, even if everything else didn’t quite work out then. As for coming back into moor, that sight would have scared me so much as well. We’ve hired fairly big yaughts from the Whitsundays a few times now, and once coming into Arlie Beach they told us to get ready for one side morring, only to realise their mistake and start yelling at us to change for the other. Things went crazy in the last five mins and I never want to repeat them again. Will hunt the series down, Cathy, it sounds fascinating! By the time I got back on deck my mouth was so dry I really couldn’t swallow. Have never had that before but you can bet one of my characters will soon experience it!! Whoa, that was a drama. And that’s really you at the top of the mast??!! I did laugh when I read that the experience would be useful in future writing but I am also seriously impressed. What an adventure! Here’s hoping future learning experiences are a little less dramatic for the trusty crew of Roo Bin Esque! Anna, you were so lucky to grow up around here. It’s such a wonderful spot and on a day like yesterday it looked like half of Brisbane was out and about. Stunning! Brenda, she is well christened. I’m only sorry I didn’t take a camera aloft along with the tools. The view (once I finally looked down after the sail was sorted) was amazing. 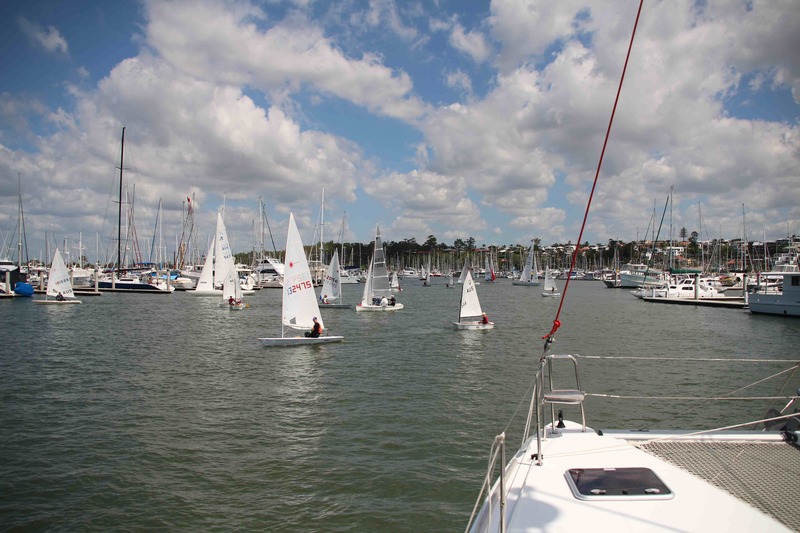 Tina, we started with a 180, but we were in danger of mowing down the dinghies that had already passed us so all we could do was pivot on the spot until there was a break in traffic… I found that more nerve wracking than being up the top of the mast! Wow, Helene, great photos! I grew up at Redland Bay so the whole Moreton Bay thing used to be my backyard. Really brought back memories! Bree, there will definitely be boating adventures in future books. Marinas are full of inspirational characters! Susanne, I did have a drink in my hand but we also splashed some French Champagne over Roo Bin Esque to appease Huey, Neptune and Aphrodite so fingers crossed they let us get on with enjoying the boat now! Sometimes you just have to throw away the plan. All the trials and tribs sound familiar. We came in from a storm and picked up some rope along the way and so no reverse when docking. We rode up on the dock, snapped a line which went off like a gun shot and lost some paint. There is a first time for everything and so now we can tick dock dancing off the list. I am laughing so much.. and totally get your 360 and head out, sometimes its just easier – seriously well done on that quick thinking! Parking is always fun in a bigger craft, with wind and currents… don’t worry too much on it – you will get the hang of it soon. Fenders out and slowly as is the 2 main ingredients to success there! Saluting your braveness for the whole day!